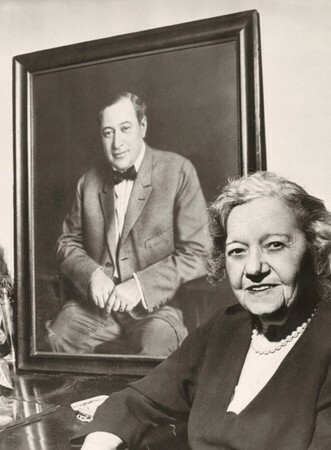 ^ Irene Wallach Harris took over her husband's business after his death. She was initially assisted by her father-in-law and her brother-in law, William. ^ Charles Klein also died in a well-known maritime disaster, the sinking of Lusitania in 1915. ^ a b "Henry B. Harris". Brooklyn Daily Eagle. April 16, 1913. p. 5. Retrieved February 26, 2017 – via Newspapers.com. ^ a b c d e f "Who Is William Harris Jr.?". Courier-News. November 8, 1920. p. 8. Retrieved February 26, 2017 – via Newspapers.com. ^ a b c "Henry B. Harris". Bristol Banner. April 26, 1912. p. 6. Retrieved February 26, 2017 – via Newspapers.com. ^ a b "Henry B. Harris, Theatrical Manager--Remarkable Career of Man Who Started Peddling Song Books". Pensacola Journal. April 26, 1908. p. 10. Retrieved February 26, 2017 – via Newspapers.com. ^ "The World of Society". Evening Star. October 19, 1899. p. 8. Retrieved November 21, 2017 – via Newspapers.com. ^ a b "Henry B. Harris". Pittsburgh Press. April 17, 1912. p. 3. Retrieved February 26, 2017 – via Newspapers.com. ^ Greene, Mabel (April 3, 1927). "Woman's Place in the Theatre". Brooklyn Daily Eagle. p. 98. Retrieved February 26, 2017 – via Newspapers.com. ^ "Sequel to a Story of Two Politicians". Anaconda Standard. May 31, 1912. p. 8. Retrieved February 27, 2017 – via Newspapers.com. ^ a b "Theater Owner and Producer, Who Sailed on Titanic, Not Listed With Survivors". San Francisco Chronicle. April 18, 1912. p. 2. Retrieved February 26, 2017 – via Newspapers.com. ^ "William Harris, Sr., Stage Veteran Dies" (PDF). New York Times. November 26, 1915. Retrieved February 27, 2017. ^ "Folies Bergere experiment reaching an end tomorrow" (PDF). Variety. New York. XXIV (4): 1. 30 September 1911. Retrieved 9 September 2017. ^ "Threatened with Revolvers". Courier-Journal. April 20, 1912. p. 1. Retrieved February 27, 2017 – via Newspapers.com. ^ a b "Threatened with revolvers 2". Courier-Journal. April 20, 1912. p. 2. Retrieved February 27, 2017 – via Newspapers.com. ^ "Mrs. Henry B. Harris". Courier-Journal. April 20, 1912. p. 1. Retrieved February 27, 2017 – via Newspapers.com. ^ "Ismay Was Not in Last Boat". Salt Lake Tribune. April 23, 1912. p. 3. Retrieved February 27, 2017 – via Newspapers.com. ^ "Many Inquiries for H. B. Harris". New York Times. April 17, 1912. p. 1. Retrieved February 27, 2017 – via Newspapers.com. ^ "Henry Birkhardt Harris". Encyclopedia Titanica. Retrieved February 27, 2017. Wikimedia Commons has media related to Henry B. Harris. This page was last edited on 4 January 2019, at 16:09 (UTC).